Are you looking to get or replace a weekend getaway boat for two? The Inflatable Sports Kayak is a tough and sporty boat for excellent paddle strokes. The 32-pounds inflatable canoe is a great possession to own, and it's compact. Regardless of its appearance, the boat's capacity is 500-pound weight. Kayaking is an outdoor sporting and relaxation events that increase bonding. Take advantage of the next vacation, camping, competition or picnic by the lake to enjoy this dependable inflated boat. With the best quality material, the 26-pound weight inflatable kayaks have enough leg space. It's beautifully partitioned for two adults to uses and can be stored after use. So, you don't have to bother about how stack able your possession is. The kayak has room for people and their possessions, and it's built to offer less paddling effort. The Strength Of the Material: The choice of material can be influenced by aesthetic beauty, texture, strength, and price. However, for Inflatable Sports Kayak Pro; its double-layer K-80 polykrylar hull material is strong. Regardless of the material's strength, it's amazing when the deflated boat is easily lifted in a carrier bag. The boat can remain, floating on water and remains a longer-lasting package. Class-III whitewater Category High-Frequency Welded Seams: To maintain a high quality, the manufacturer ensured an air-tight inflatable boat. The production process used ten thousand (10000) volts of electric power to fuse the material and firmly hold the frame. The fabrication technique makes a solid structure that the owner of this inflatable kayak will enjoy. Buyers of products desire durability and rigid watercraft. Regardless of their color, the welded seams and I-beam construction determine the kayak's quality. Don't worry about the risk of careless puncturing; the material is puncture-resistant and strong. Easy Stacking: Size is not everything when it comes to inflating with air. A giant kayak can be deflated with a few minutes and stacked. Ideally, the soft body material allows easy handling during and after installation. The kayak is not cumbersome to deflate and transport to water; the close and open drain valve makes it seamless. However, the valves are one of industry's best (one-way valves for inflation/deflation) and are important. The seats are fold able and can fit with the boat into the shoulder carrier bag provided for stacking. The size of the carrier bag with the deflated material can stay comfortably in the boot of your vehicle. So, transportation of this product is not a hassle. Spacious and Set to Go: With the pair of the paddle and a loaded carrier bag; you are set to go and have fun. Easy paddling during kayaking is pleasurable and enhances your skill. Apart from the extra rigidity, the inflatable kayak offers space because of its size. The boat is wide by measurement of 34 inches. Its length is eleven feet and two inches. The extra space after your leg is comfortable can accommodate your bag, food, or drinks. The inflatable boat has an advance valve-opening technique. Some of the craft's valve features are; 3 deluxe one-way and self-bailing drain easy-to-inflate valves. It has some impressive aquadynamic features and double-stitch finishing that appears like a fine handmade watercraft. Double skews underneath the inflatable kayak; the accessories enhance speed and tracking. Lightweight, the sturdy and durable material with simple design and detachable seats. The package comes with complete accessories; two units of detachable and inflatable DKS seats, AB30 paddles, a foot pump and carrier bag with tough straps as handles. The valves of the beautiful sports Kayak must be handled with care because the valve cover easily rips off when handled carelessly. 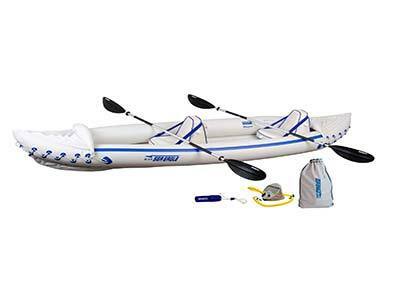 You have made a valuable choice by purchasing this inflatable sports Kayak. Allow you pleasure of pampering your camping pieces of equipment with a portable kayak that you can be proud of during picnics, camping and holidays. The interior is roomy with a dimension that fits two adults and their packages. In less than ten minutes, your fold able kayak can be inflated and assembled beside the water. More so, when the beautiful boat lands on water, it moves with great precision and easy paddling. So, this product is a delightful possession that is valuable.